Penicillins (eg, oxacillin, nafcillin) that are stable at room temperature for greater than 24 hours can be used in the outpatient setting with continuous infusion pumps. These agents are dosed by summing the total daily dose and then extending the infusion over 24 hours. As an example, nafcillin dosed intermittently at 2 grams every 4 hours with 30-minute infusions would be continuously infused as 12 grams over 24 hours. 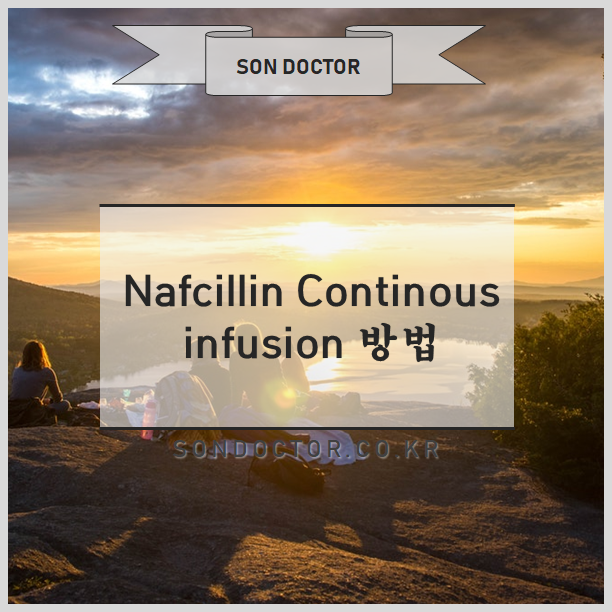 Nafcillin continous infusion 시에는 하루에 투여할 양을 합하여 수액에 mix 한 뒤 24시간동안 나누어 천천히 투여하면 된다. Native valve: 12 g/day in 4 or 6 divided doses (ie, 2 g every 4 hours or 3 g every 6 hours) for 6 weeks. Note:Duration intended for complicated right-sided infective endocarditis (IE) or left-sided IE. For uncomplicated right-sided IE, 2 weeks of therapy may be adequate (AHA [Baddour 2015]). 아마도 MSSA bacteremia 상황에서 Nafcillin 을 많이 찾게될 것이다. 이 경우 2g 을 4시간 마다 주면되는데, 하루에 6번을 주게되므로, 12g 을 수액에 mix 해서 24시간 동안 투여하면 된다. No dosage adjustment necessary; use with caution in patients with concomitant hepatic impairment. Poorly dialyzed. No supplemental dose or dosage adjustment necessary, including patients on intermittent hemodialysis, peritoneal dialysis, or continuous renal replacement therapy (eg, CVVHD) (Aronoff 2007; Heintz 2009). 대체로 MSSA bacteremia 가 있을 많한 환자들은 아마도 renal failure 가 동반되었을 가능성이 높다. 신기능 장애시, 심지어 RRT 를 하고 있더라도 용량 조정이 필요없다고 한다. There are no dosage adjustments provided in the manufacturer's labeling. Nafcillin primarily undergoes hepatic metabolism; dosage adjustment may be necessary, particularly in the setting of concomitant renal impairment.